The night began with actor Alec Baldwin imploring the lawyers in the room to donate more money to the Brennan Center for Justice at the NYU School of Law and ended with a pledge from comedian Bill Cosby to begin funding the Law School’s Thurgood Marshall Scholarship. The Brennan Center’s Legacy Awards dinner, which drew nearly 800 people, is held annually to pay tribute to the values of U.S. democracy and to raise funds for the Center. This year, Martin Lipton (’55), chair of the NYU Board of Trustees, Elaine Jones, president and director-counsel of the NAACP Legal Defense and Educational Fund, and Cosby were recognized for their human justice work. Lipton modestly accepted his award, noting that it took more than a few calls to convince him to be a recipient. “I am here because of a great, great partnership between four friends forged 50 years ago at the New York University School of Law,” Lipton said, referring to the creation of his law firm Wachtell, Lipton, Rosen & Katz in 1965 by himself and three other NYU School of Law graduates, Herbert Wachtell (’54), Leonard Rosen (’54), and the late George Katz (’54). Lipton was heralded not only for his commitment to the NYU School of Law, but also for his leadership and generosity to major educational and cultural institutions benefiting equality and human dignity. Through his firm, Lipton has spearheaded various efforts in the public and private sectors, including the establishment of a $5 million scholarship fund at New York University for the dependents of firefighters, police officers, and emergency medical personnel who died during the rescue efforts after the attacks at the World Trade Center on September 11, 2001. Lipton also served as president of the NYU School of Law Board of Trustees for 10 years and is a recipient of the University’s Gallatin Medal, the Law School’s Vanderbilt Medal, and a Presidential Citation. 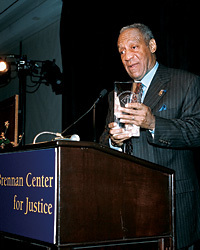 The Brennan Center, created in 1995 by Brennan’s family and his former clerks, has dedicated itself to promoting equality and human dignity through scholarship, public education, and legal action. The Center’s projects include reforming the campaign finance system, promoting fair courts and democratic participation, increasing economic justice and access to the courts, and improving criminal justice policy. The Center represents a new model of public-interest legal advocacy not only because of its wideranging docket of cases, but also in large part because of its relationship with the NYU School of Law, which connects the lawyers and advocates employed at the Brennan Center with the scholars of the Law School. “We hope to make this a model in the country at large to put idea people together with advocates,” Gerety said.